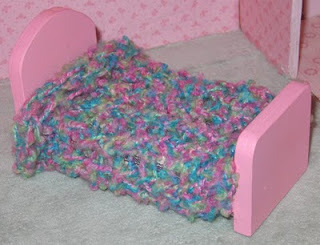 Using a knitting loom (this one was done with the Knifty Knitter brand) you can knit a small swatch and very quickly have a dollhouse bedspread or blanket. If you've never used a Knifty Knitter before, I highly recommend them! They're good for all kinds of projects. You don't have to know anything about knitting or crocheting to use them... you just wind yarn over and over, always taking the bottom loop off the peg!